This is a from Jordie van Rijn, an Email Marketing Consultant with substantial experience in email marketing and marketing automation. He works for Email Monday. In this post, Jordie talks us through how you should use storytelling to spark audience attention. Jordie doesn’t blog for us on a regular basis but is a friend of State of Digital. Hate to be the one to break it to you, but the truth is, no one cares about you, or your products. In the digital age, we’re constantly being barraged with interruptive, irrelevant marketing noise. Adding more to the mix isn’t going to help. If you really want to drive impact with your messaging, think about what people want to see. Make your content compelling, tell a great story. Storytelling is one of the most pervasive tactics in content marketing. 57% of marketers focus on it in their strategies. And yet, 68% of marketers who have documented content strategies report that their content is only somewhat or slightly effective. Anyone can tell a story, but clearly, not everyone can tell a good one. According to Nielsen, the global content marketing industry produces more than 27 million shared pieces of content per day. There’s so much to read, see, listen to and watch that “content shock” is becoming a real thing. Despite seeing roughly 1,707 banner ads each month, consumers have learned to tune them out. Only 0.1% get clicks. Google’s algorithm adjustments and search result design changes make SEO rankings increasingly competitive. And let’s face it – people don’t like being bombarded with ads. That’s why the “Skip Ad” button on video content is such a popular feature, and services like Vevo, Spotify, Hulu and YouTube offer premium subscription options that are ad-free. Even the New York Times is reportedly developing an ad-free version. You need to capture the attention of your audience, and attention is at a premium. It’s become so hard to obtain that many paid media vendors are billing advertisers using attention metrics. The Economist was one of the first to make the switch, but several others publishers, including The Guardian, have voiced the desire to head in that direction. 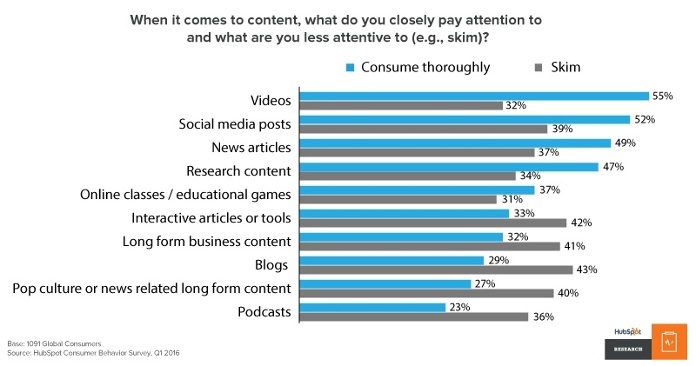 Attention scarcity is why marketers are increasingly placing focus on useful “content” that resonates, as opposed to sales-oriented advertising. Doesn’t matter if your message is going to appear on earned, owned or paid media channels – having a great story to tell, and the right place to tell it, is a big part of the solution. The content you create needs to connect with the intended audience, have a clear call to action, and keep their interest. The best messaging commands attention by being entertaining, useful or informative and emotionally evocative. Tell compelling stories, and put your audience members at the center of the stories – either directly or indirectly. That’s why the American campaign by AT&T’s #ItCanWait, for example, is so effective. There are details in the story that people can identify with, and as shameless as the ending is, it’s emotionally evocative. Have you ever checked a new message alert while driving? The campaign also offers something the audience can use. A potentially life-saving tip (don’t text and drive) that sells an app, DriveMode, which makes sure they can put that tip into action. But would this video clip have the same effect if you saw a 30-second version of it on a TV in your kid’s favorite restaurant, half-watching, with screaming children running around? Probably not. Delivery matters so much that people actually appreciate branded infotainment content when it’s in the right context. Impax Media, for example, is using digital attention tracking technology to gather analytics and serve up branded videos to customers waiting in retail checkout lines. The company’s entire platform favors infotainment as opposed to traditional hard sell messaging. Last year they ran a pilot with approximately 1,000 screens in 20 stores across Canada. Their displays included video infotainment spots for Wrigley’s, Legos, Werther’s Original, and Mars. The success of that pilot paved the way for the company’s strong entrance into the US market this year. The growth of a company like Impax Media can be evidence of the power of contextual infotainment – well-crafted content delivered in a setting where the consumer wants to experience it – not where it’s considered a nuisance. 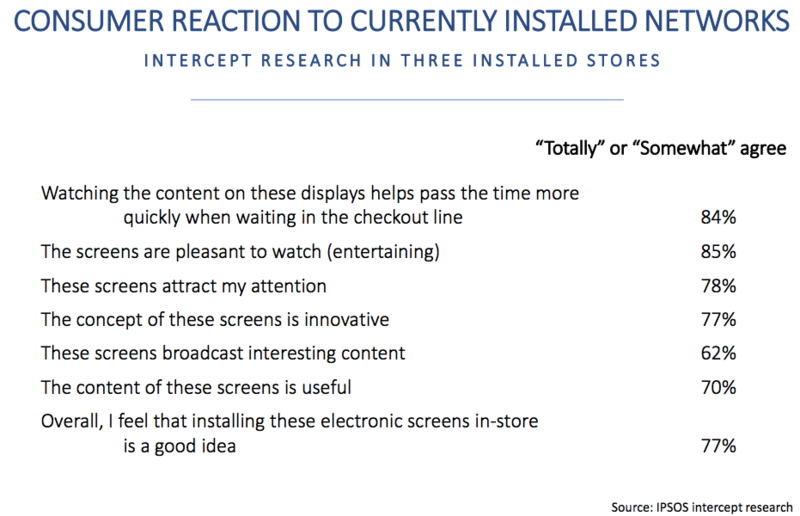 The company commissioned a study that found consumers actually want to see branded video content to help them pass the time at the checkout line, as shown in the graph below. This is the power of smart OOH (out-of-home) media placement. Today we’re trained to expect specific stimuli in different settings, and we’re 33% more alert when we leave our houses. Most people are also more active on social and other online media when on the go. Research shows that 7 in 10 people on the street are primed to make purchases, and 6 in 10 end up buying things they didn’t expect to. Smart marketers know that capturing audience attention with great content on the right platform also requires a cross-channel media engagement strategy. Placing carefully chosen calls to action in your content can encourage social media follows and email sign-ups, even from your offline channels. It doesn’t matter if you’re asking people to post using a hashtag, scan a QR code or point their browsers to a simplified URL. With infotainment, the goal is not always going to be immediate sales conversions. It can be about building brand equity for engagement and loyalty over time, and that’s where tactics like social media contests and email marketing automation can make a big difference. Savvy cross-channel messaging provides you with a large audience that’s pre-qualified to be ready and willing to consume your content. That’s a huge advantage, especially given the way we consume media today. Thanks to content shock, the culture of instant gratification, our love of hand-held touchscreens and the distractions of push notifications, we’ve learned to split our attention to the point where we’re capable of letting content wash over us. Different formats, however, call for different levels of focus. According to new research from HubSpot, video is the most commanding medium, with 55% of viewers reporting that they watch it thoroughly. Oddly enough, blog posts, which make up a major focal point of most marketing plans, are only thoroughly consumed by 29% of the population. Expose people to your message on social media, however, and you’ll see those numbers spike. Social media posts get read thoroughly by another 52% of viewers. These high “skim rates” are hardly surprising. Overall, the ways in which content can be delivered online are growing exponentially. Blogs, banner ads, video clips, podcasts, research reports, email courses, ebooks, webinars – you name it. Audiences have a world of options. Offline growth is happening quickly, too. Print media is far from dead, and thanks to programmatic booking, killer performance metrics and new attention tracking capabilities, OOH advertising is increasingly becoming a key aspect of the savvy marketing mix. In the digital age, it’s likely that “hard sell” marketing assets are tuned out by more than a quarter of audience members. 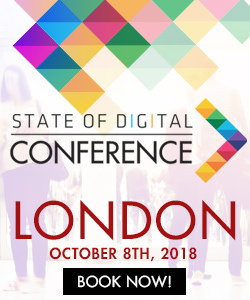 Today we have more control over our media experiences than ever before, and the data shows that we want content that is useful, informative, personally pertinent, contextually relevant, available on demand and beautifully crafted. What are the best ways to get people to pay attention to your messaging? Skip the pitch and use storytelling to get them emotionally involved. Distribute your messaging in formats and contextual placements that align well with people’s lifestyles. Take smart cross-channel engagement goals into account. Creating video clips that feel like movies, or that provide useful tips, might seem on the surface like a hopelessly indirect way to drive revenues, but infotainment commands attention beautifully and encourages viral shares. Buying rotation spots on digital video screens in public places might seem on the surface like an outdated tactic, but with the right creative, it can be exactly what people want to see in the context of what they’re doing. 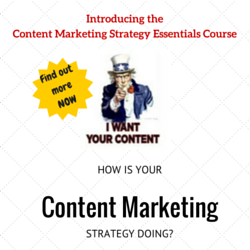 Very informative angle on content marketing that I haven’t seen before. Love the infographics and research data that connects the dots. Definitely will be keeping this “story telling” model of marketing in mind when writing future articles. Two thumbs up for a great read!